The horseshoe, the walrus, and the handlebar....oh my! So I always thought that every guy should have a mustache...because my dad always had one! It just never crossed my mind that some guys wouldn't want one...or couldn't grow one. Let's face it...mustaches (or moustaches....a fancier spelling??) are just super-cool. me and my dad, circa 1983. Sweet "stache", Tom! 30 years later! I've never seen my dad a single day without a mustache! So just a week or so ago I got a somewhat last-minute request for some mustache cookies. My calendar for the week was crazy full but I just kept thinking about making these cookies and how hilarious it would be. We were at the lake when I got the email so we all laughed about how silly the mustache cookies would be and Rob kept saying that I should just agree to do it. Obviously Rob's a supporter of facial hair. He's had a goatee since like 7th grade and could buy cigarettes and chewing tobacco at the age of 15 without being carded. Anyyyyway, I started to search online for mustache cookie cutters and I was really lucky to find someone selling them in New York which was only a 2-day shipping time. So I ordered them and agreed to do the order. This customer was super-easy to work with because he was so open to my suggestions and just let me design as I wished. Love when that happens! He did want the cookies on sticks kind of like masquerade masks where the stick is off centered and you can hold it up to your face. Brilliant! I baked at least 15 extra because I was nervous about the mustaches being too narrow to stay on the stick. But I supported the back of each cookie with some extra dough and they were really quite sturdy on the stick. And then I decorated a bunch of extra ones, too....because they were just so much fun to make! Mia and I got so many laughs from playing with the extra ones. She was running around saying "I look like Pap-Pap!!" And then she looked in the mirror and really shocked herself with what she saw. lol. She is seriously the funniest kid ever. "I look like Pap Pap!" The best part ever was when I logged onto my business facebook page the other day and saw this picture that had been posted from someone at the mustache party. 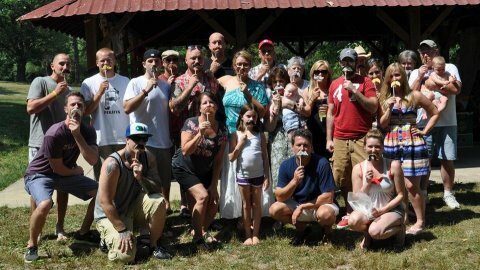 I seriously think it's the best picture ever....everyone and their mustache cookies! This should SO be framed and be hanging on someone's wall. Hope you enjoyed! Have a really great 4th of July!! I'm making almond pound cake and cutting it into stars with my cookie cutters! Thank you Pinterest!